The photography program for Grades 7 and 8 focuses on the creative and technical aspects of both the film and digital worlds. Students seek to find their unique vision in our state-of-the-art darkroom, and they also experience digital photography through photo shop manipulations and experiments. Students create their own personal archival books, produce displays of artwork, and participate in professional critiques of their work. Working with clay is a unique and specialized art form that has spanned many centuries and cultures. Using a hands-on approach, students in Grades 7 and 8 explore the nature of ceramics and the role it has played around the world. 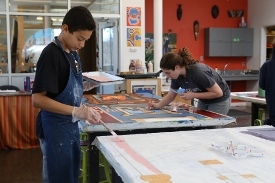 Using a variety of hand-building techniques, students create a body of work that includes functional and purely aesthetic work. Technical skills and imagination are the key ingredients, and both have an important place in the fun-filled ceramics room. The music program enhances students’ enjoyment and understanding of music, often complementing studies in other areas. Through listening, singing, playing instruments, and performing, fifth and sixth graders learn about music as varied as classical repertoire, American folk music, Zimbabwean marimba music and the Blues. All fifth grade students sing in chorus. Sixth graders receive basic guitar instruction. Seventh and eighth graders may choose guitar, vocal ensemble, or handbells as music electives. Each spring all seventh and eighth graders become the cast and crew of a full-length Broadway musical.